Publisher: Thomas Nelson and Sons. No date, circa 1915. Condition: Hardcover, decorative cloth. Covers bright, pages heavily foxed. With 14 black and white plates. 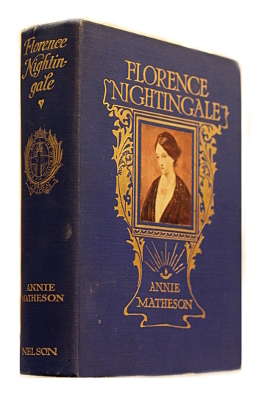 An easy to read, engaging biography of Florence Nightingale. Florence Nightingale, OM, RRC (12 May 1820 – 13 August 1910) was a celebrated English social reformer and statistician, and the founder of modern nursing. She came to prominence while serving as a nurse during the Crimean War, where she tended to wounded soldiers. She was known as “The Lady with the Lamp” after her habit of making rounds at night. Early 21st century commentators have asserted Nightingale’s achievements in the Crimean War had been exaggerated by the media at the time, to satisfy the public’s need for a hero, but her later achievements remain widely accepted. In 1860, Nightingale laid the foundation of professional nursing with the establishment of her nursing school at St Thomas’ Hospital in London. It was the first secular nursing school in the world, now part of King’s College London. The Nightingale Pledge taken by new nurses was named in her honour, and the annual International Nurses Day is celebrated around the world on her birthday. Her social reforms include improving healthcare for all sections of British society, improving healthcare and advocating better hunger relief in India, helping to abolish laws regulating prostitution that were over-harsh to women, and expanding the acceptable forms of female participation in the workforce. Nightingale was a prodigious and versatile writer. In her lifetime much of her published work was concerned with spreading medical knowledge. Some of her tracts were written in simple English so that they could easily be understood by those with poor literary skills. She also helped popularise the graphical presentation of statistical data. Much of her writing, including her extensive work on religion and mysticism, has only been published posthumously.